A Biking Paradise in Rochester, N.Y.! That&apos;s a common reaction from visitors from other parts of the country and the world when they come to Rochester, N.Y. and the surrounding region. True, the city of Rochester is an urban center rich with arts and culture, great food and drink, and attractions for the entire family. 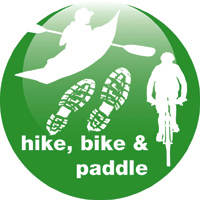 But if you&apos;re looking for outdoor fun - bring your bike, your hiking shoes, or your paddle. And schedule plenty of time here to enjoy your sport! We&apos;ve got more than 12,000 acres of parkland, over 100 miles of well-marked trails, and waterways ranging from rivers and lakes to the historic Erie Canal. A good resource to finding trails in the Rochester area for both cyclists and hikers is the "Genesee-Finger Lakes Regions Trails Guide" compiled by the Genesee Region Trails Coalition. It lists 30 multi-use trails along with parks and other recreation areas. Free wheeling! Bring your bike. Bicycling Magazine named Rochester "One of the top bike-friendly cities in the U.S."
Why? Scenic trails, new bike lanes and well-maintained roadways attract cyclists here from all over the world. Municipal buses have bike racks. There are 45 lane miles of on-street bicycle facilities in the City of Rochester. Cyclists come here for recreational, racing, tandem, recumbent, and mountain biking. They come from every U.S. state, every Canadian province and countries around the world to indulge their two-wheeling passion. Whether you bring your own bike or rent one, you&apos;ll find outstanding recreational, off-road and urban bike trails. With its impressive array of recreational and off-road trails plus well-maintained highways, you may find yourself singing the praises of this bike-friendly community. Urban bike trails and most major streets have lanes that are wide enough to accommodate a bicyclist&apos;s needs, while state and county roads have paved shoulders, separated from lanes of motorized traffic by a white stripe. Most local trails also provide smooth riding on surfaces ranging from stone dust (sedimentary rock) to asphalt. Another option is to travel rural roads with little traffic and picturesque villages providing good rest stops. Opportunities for beautifully scenic rides in the Rochester area are remarkable with recreational trails ranging from 1 mile (1.6 km) to more than 50 miles (80 km). 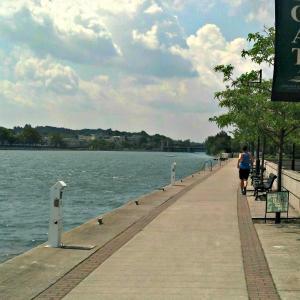 New York&apos;s world-renowned Erie Canal System is a perfect ride for the littlest cyclists on training wheels to grandparents out for a leisurely spin, with wide, flat, safe and open paths that run along the canal side through parks and villages. Enjoy the views and cooling breezes of a ride along the shoreline of vast Lake Ontario -- one of America&apos;s five Great Lakes. If you&apos;re ambitious you may also want to follow the Genesee River south into Letchworth State Park, the "Grand Canyon of the East," with a 40-mile ride from Rochester using the scenic Riverview Trail and Genesee Valley Greenway. If you enjoy pedaling with other biking enthusiasts, you&apos;ll find a warm welcome from members of local recreational, racing, tandem, recumbent and mountain biking clubs. Annual biking activities include nearly 20 major rides for charity, more than 300 club rides, and a series of weekly race-training rides. 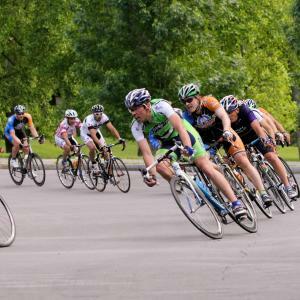 The Rochester Bicycling Club is an excellent resource for rides - they schedule over 400 rides a year covering the greater Rochester area and the beautiful Finger Lakes region of Upstate New York with a focus on fun, safety and fitness. The Flower City Looking Good program from the City of Rochester offers many guided walking or bike tours - a chance to "Get out, Get fit & Enjoy the City." Bike races in the Rochester area include the ultra-marathon QuadZilla - 4 consecutive 125-mile rides that start in Ithaca, loop through vineyards in the Finger Lakes, up and down steep climbs and choppy rollers, through Letchworth State Park into the countryside of Geneseo, past Fair Haven State Beach on Lake Ontario and back to Ithaca in 48 hours! These are also qualifying races for the major randonneur races in France and New England. Rounding out the annual cycling season are the Cobb&apos;s Hill Cyclocross, Ellison Park Cyclocross, and the Webster Park Cyclocross races for riders of every ability and experience levels, from beginners to world-class professionals - run by Full Moon Vista bike shop in Rochester&apos;s South Wedge neighborhood. In fact -- Rochester has great services for its cycling visitors. With many full-service, family-owned bicycle shops scattered throughout the greater Rochester area, cyclists will find a good range of parts and service options when needed. There are also plenty of lodging facilities, from bed & breakfast inns and family-operated motels to national hotel chains -- all ready to accommodate people who wouldn&apos;t think of traveling without their bikes!